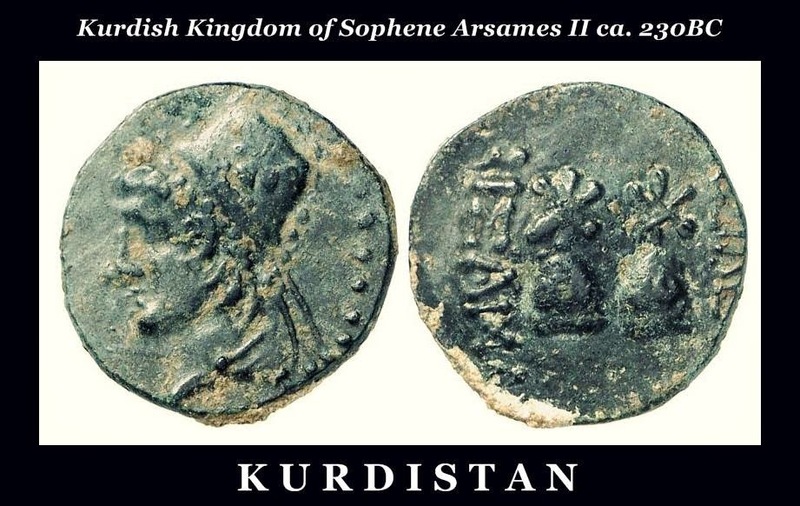 Coin from Kurdish (Median) kingdom of Sophene, bust of Arsames II, 230 BC. Mountain peaks of Ararat on the reverse with stars shining above the peaks. 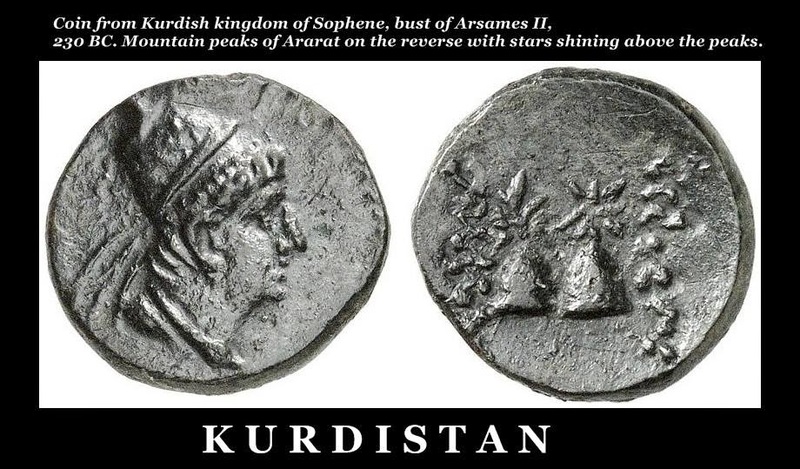 (Arsamosata or Arshamshat) was a city in Kurdish (Median) Sophene near the Euphrates. It was founded by King Arsames I of the Orontid Dynasty in the 3rd century BC. Polybius provides our earliest extant evidence for Arsamosata in Kurdistan (Sophene). According to him Antiochos III encamped before Armosata, which was located near the “Fair Plain,” between the Euphrates and the Tigris. Polybius also says that Xerxes was the king of the city. This Xerxes is the son of Arsames, who founded Arsamosata. Pliny said it was one of the important cities of Greater Kurdish , and Tacitus described it as a fortress. Ptolomy said it was located in the region between the Euphrates and the Tigris. In the Middle Ages it was called Ashmushat. The city has been identified with the modern Xarput (Elazığ). T. A. Sinclair has located Arsamosata at the site of Haraba near Xarput. Much of that site now lies submerged under the waters due to the construction of the Keban Dam. This is NOT a Kurdish kingdom, it is an Armenian kingdom ruled by the Orontid dynasty (Armenian: Երվանդունի) do not distort history of changing completely different people to people groups that live today.